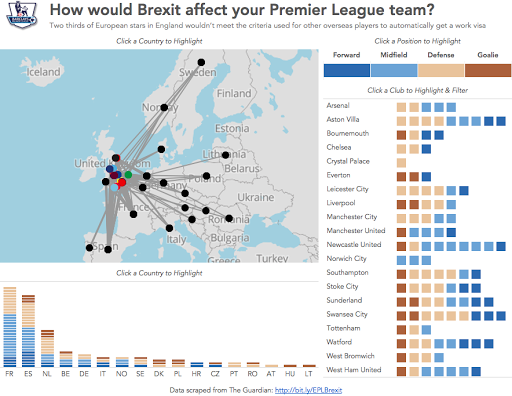 Brexit: How will it affect your favourite Premier League team? Brexit is a hot topic in the news these days over here in the UK. The ramifications are far and wide. Leaving the EU would mean a LOT of lost jobs, impacting even the Data School and the Premier League. 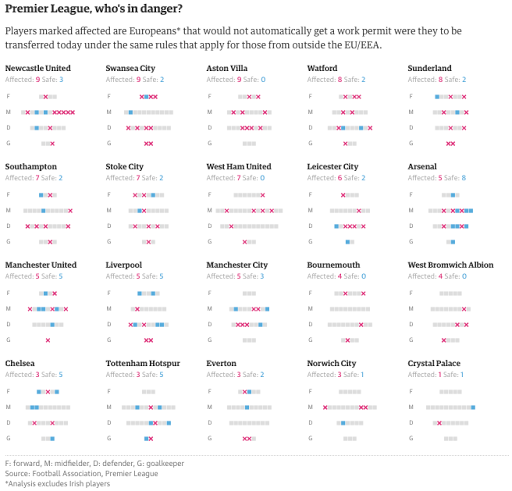 Back in September, The Guardian wrote an article and created this visualisation to show which teams in the Premier League would be impacted the most. I like the layout of this, but what it lacks is a simple way to see where the players that are impacted come from. I also wanted an excuse to practice the new Union feature in Tableau 9.3. It took me a couple of hours to recreate the data set and then another hour or so to create the interactive viz below. Find your team and see how many players they could lose if Brexit happens!